Earlier topic: Vandercook # 2 Proof Press Blanket? 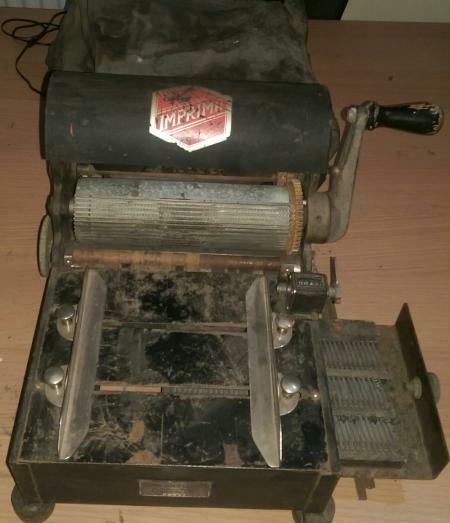 Can someone please help in offering some information pertaining to this Dapag Press. I found it in my grandfathers garage and have given it a bit of a clean. I can’t seem to find any info about the machine itself. There is a bit of information regarding the company but not the machine. The only other one I found is in a museum in NZ. 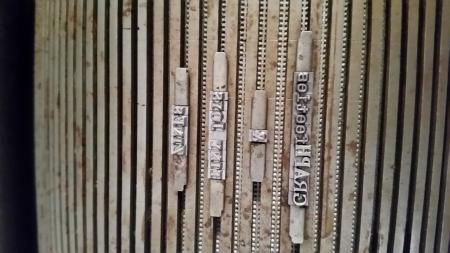 Is it rare?, and would the letterpress enthusiast find it desirable? It says Dapag 1943 Ltd, 23 Holburn Viaduct. London EC1 Model No 7087. Thanking you all in advance for your time. It looks like it is meant to operate similarly to the Multigraph letterpress machine, but with a more limited application. I can’t see what’s in the drawer, but if it’s type to be inserted into the slots on the cylinder, it looks pretty limited in variety. I wonder if the machine was intended for such tasks as letterhead or billhead printing. Your press is a small office machine that uses Multigraph type. The type is T shaped at the bottom and slides into the slots around the drum with clips at each end of the line to hold the type in place. It was an alternative to the office.duplicators that used stencils. If you Google Multigraph you will see similar machines. Dapag (1943) Ltd supplied three types of small office and labelling machines, the Langapres that used normal letterpress type for label printing, the Tickopress also for labelling using Multigraph type and the Dapag rotary that you have. Many thanks for the information, it is much appreciated. Would anyone know a date? If you ever think of printing with this machine again, new type is still available for it from Rainer Gerstenberg in Germany. Thanks for that information Thomas, I have had an enquiry in the past about the type. I’m the NZ owner referred to by emeraldisle and I’ve found that it can be also used to print flexible polymer “rubber stamp” images (all the rage with ‘stampers)by fixing to the ribbed drum with double sided tape, and then adjusting the pressure to lower the type drum to paper. My problem, how do you lock in the characters and what exactly do the adjustment wheels on either side of the press do ? If it’s like my multigraph, there are small metal clips that you can pop into the grooves on either side of your type to keep it in place.